They exist, and the one I am going to tell you about here is positively amazing on both counts. If you have been following along with my arc into the madness that is doctoral work you will remember me being greatly aided in sanity by getting back into comic books. Like all things I have tried to absorb everything that is going on in the world thereof and have started following many comic book artist and writers on twitter (Fun fact: many of them are super interactive on social media). They share rants and works in progress (WIP), sketches, updates, previews, and a host of other things. Twitter is how I found out about the Science comics series. I can’t remember who retweeted some of the art from it (I tried finding it, but my twitter feed is almost as bad as my Facebook overload) and I started tracking it down. I am trained in paleontology (Eocene, not dinosaurs specifically) and have since moved into the History of Science to study the history of field explorations centered around paleontological madness. I do this on several public fronts which means I get a lot if dinosaur stuff sent my way. I try to keep up with the news and share it through the Paleo Porch Facebook page as well. I also run a traveling museum of sorts filled with replica dinosaur claws, mammoth teeth, scale skulls, etc. so I am constantly looking for ways to share this stuff with others. This is one of the first reasons I fell in I’ve with :01 First Second’s Dinosaurs Fossils and Feathers. Then, it got even better. For anyone with more than a passing interesting in the people that shaped what we have come to know as geology there are recognizable names: Smith, Buckland, Mantell, Owen, Cope, Marsh, etc. that form the mental Mount Rushmore of early Paleontology. 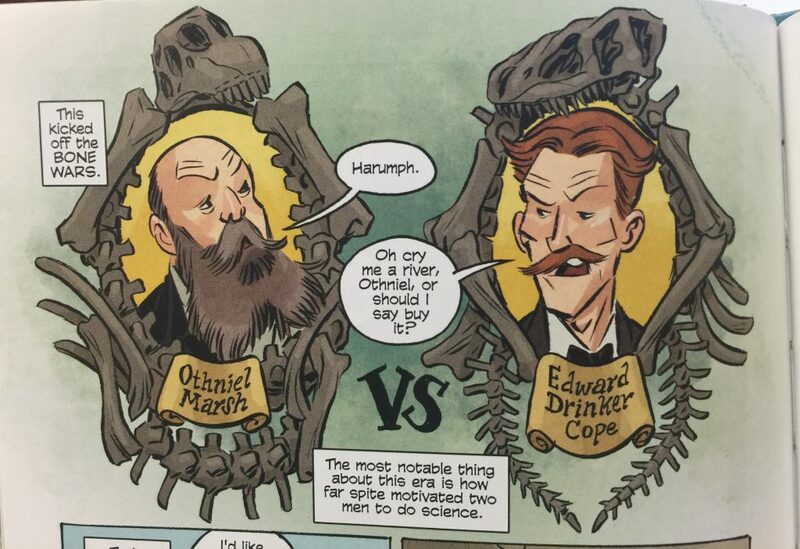 Or at the very least the most famous (or infamous) accounts in the Bone Wars. 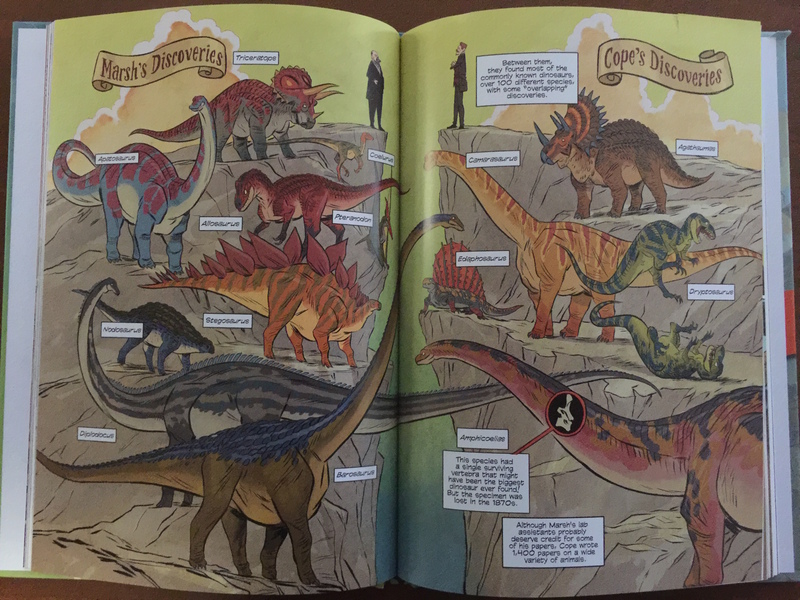 They are all here, and they are all described and drawn beautifully. 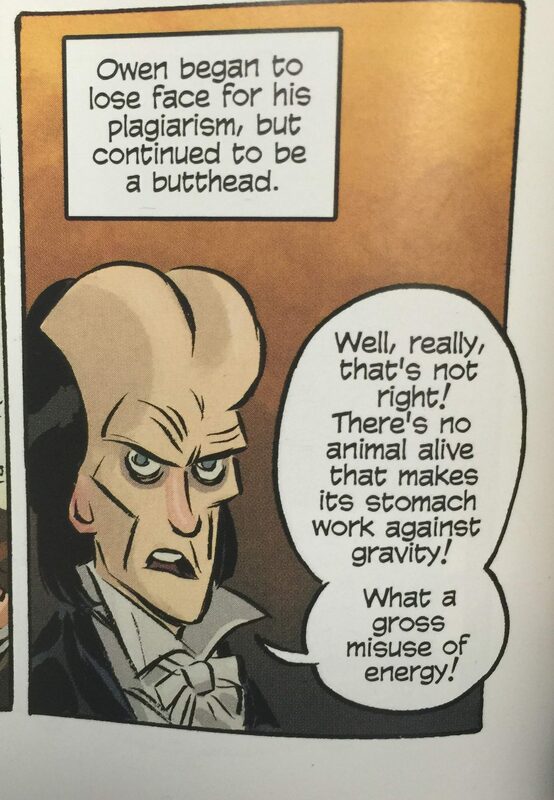 because in reality Richard Owen was a butthead of the first order. The writing is superb and clever and Joe Flood‘s art flows with it unimaginably well. Dinosaurs Fossils and Feather is filled with not only science but that science’s history as well, and not just the well known history either. 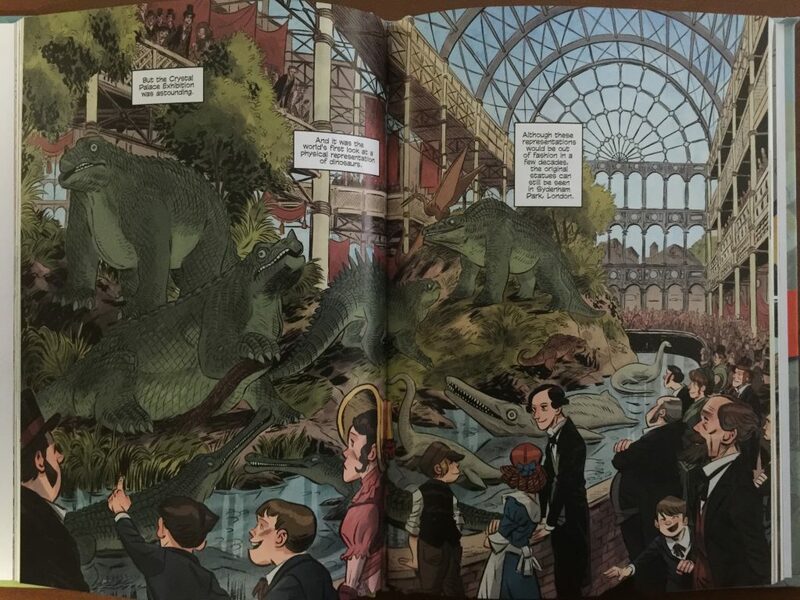 Of course the double page spreads of Mary Anning in the Field, of the Crystal Palace, and Roy Chapman Andrews are all prints I wish I had in my office but they include an enormous swath of paleontologist rarely discussed outside hard science circles. 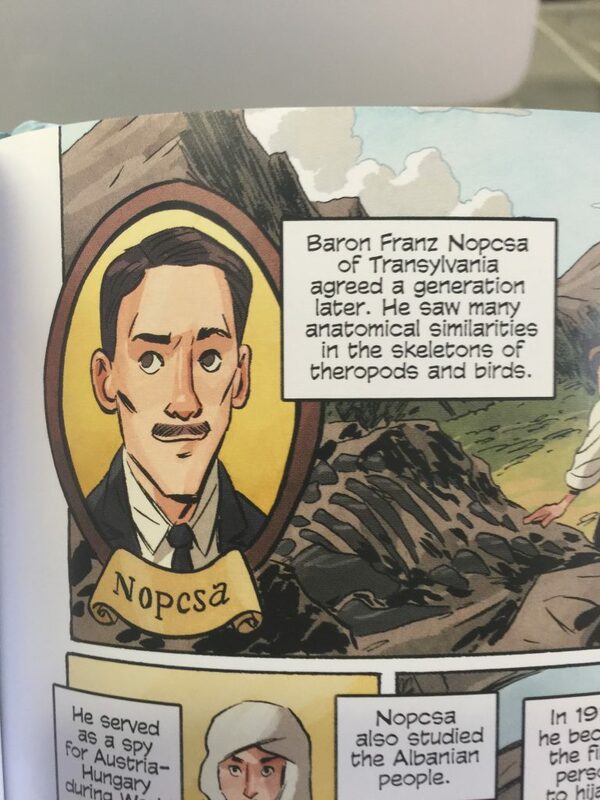 Seriously, how many of you know the story about the Transylvanian paleobiologist Franz Nopcsa? Really, see? 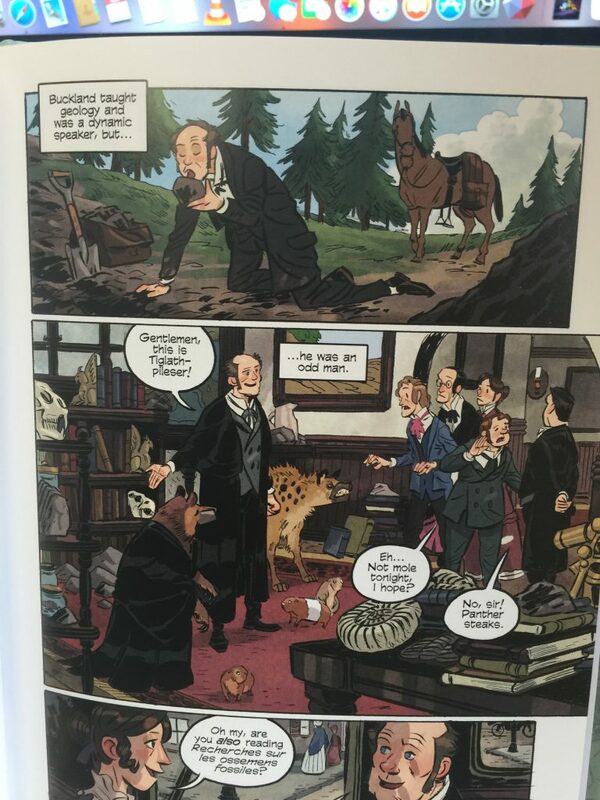 There you go, he is in this book, in comic form, which hides his tragic ending, but highlights his contributions to geology. Alfred Wegener is here too! They could have chosen to talk about how he was mostly correct eventually and now we know how brilliant he was, but there is another personal favorite panel of mine included that shows why he was dismissed. 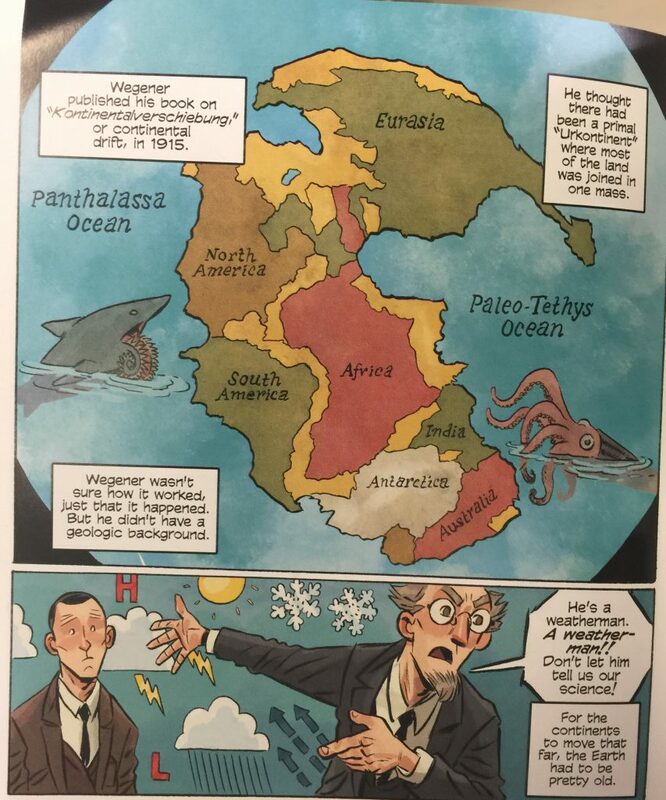 Really, how could a meteorologist (scientific, not TV forecaster by the way) dare think about the continents. Incidentally there is a much anticipated (by me and more than a few other historians of earth science) book about Wegener that is out this year too called Alfred Wegner: Science, Exploration and the Theory of Continental Drift that will be as close to a complete look at Wegener as we will likely ever see. Get this book. 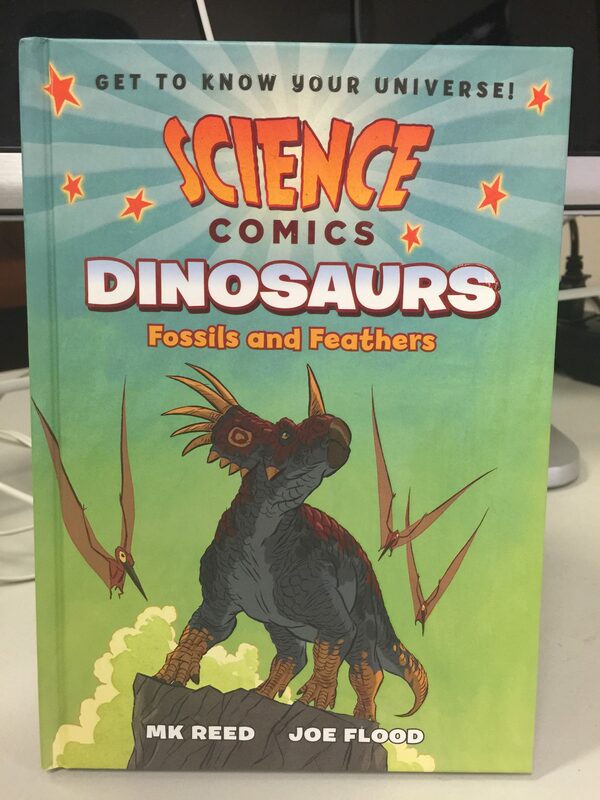 Get it for yourself, get it for your kids, get it for your friends’ kids. 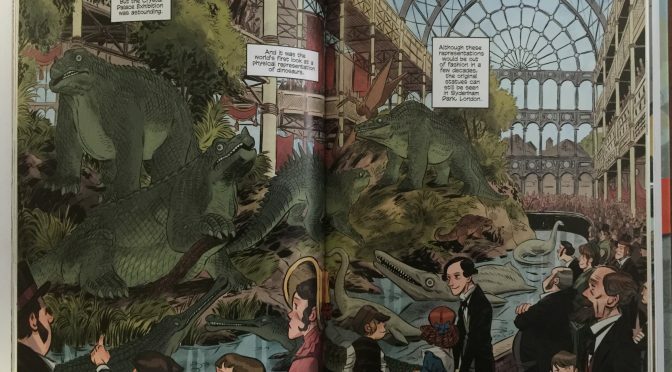 The writing is brilliant, the art is stunning, the science is excellent, and the history is fantastic (not just for graphic novel standards but for history standards). If only it were at all possible to have full biographies of each of their included players done in this same tone and style. I have highlighted only a few great things about this little book. There are many, many more. 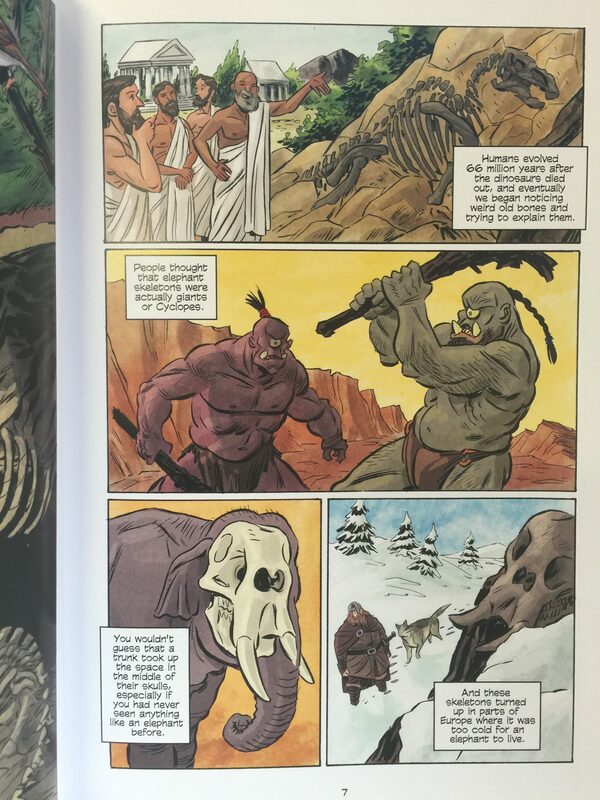 If I must be hard pressed to find something to complain about, or to point out as a shortcoming, I should choose to saw that I wish this book was a larger format so the pages and art would be larger. I will end with a final snapshot merely because I have portraits of E.D. Cope and O.C. Marsh hanging in my study at home which would benefit from these more stately bone crests.